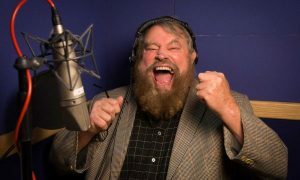 Are you looking for a Brian Blessed Impressionist and voiceover artist? Thanks for visiting. This page features some fun audio and video examples from Brian Blessed Impressionist, Darren Altman. One of the most distinctive voices in Britain has to be Brian Blessed. His trademark booming sound can be heard on countless radio and tv adverts, as well as cartoons such as Peppa Pig. As soon as you hear it, your ears can’t help but to prick up! When performing an impersonation of Brian, it’s not all about yelling and booming at the top of your voice. Brian is of course a skilled actor and has total command of his volume and timbre. He has a very distinctive whispered sound and it’s important to be able to speak in his hushed tones, as well as his bombastic voice. Here’s a fun radio advert I voiced, for a Mitsubishi car dealership. I voiced a bunch of promos as Brian for gaming and electronics chain, CEX. Thanks for checking out my page. If you need any more information about my Brian Blessed voice, then get in touch and I’ll be happy to help.